Founded in 1982, Insul-Therm, Inc., an employee owned corporation, was formed with the goal of distributing and fabricating high quality insulation products for the industrial and commercial insulation markets. This goal, coupled with the philosophy of providing service second to none, has resulted in the growth of Insul-Therm into the largest insulation distributor/fabricator in the Western United States. In 1996, Insul-Therm International, Inc. was created to better facilitate the needs, expectations, and special requirements for our domestic and international customers. The direction of Insul-Therm International, Inc. focuses on operating temperatures from -450° to 1200° F in the commercial and industrial insulation markets. 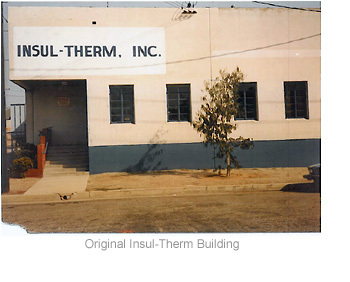 In 2001 Insul-Therm International, Inc. expanded our presence into a second production facility in Sacramento, CA. This expansion enabled us to better serve our customers. Insul-Therm International, Inc., continually strives to provide our customers with technical innovations and excellent customer service that exceeds all expectations. As new products and services are introduced to our industry, Insul-Therm International, Inc. will be there leading the way to more efficient, cost effective, energy conservation solutions. Copyright © Insul-Therm International, Inc. All Rights Reserved.